Grist / ShutterstockNow here’s something everyone can enjoy. Imagine, if you will, a Thanksgiving table of plenty not anchored by a meaty, glistening bird. In its place of honor, rather, sits a bowl of sea-chilled, slimy oysters. No? Don’t like that? How about a plank of grilled salmon? Venison steak? Mushroom casserole? Heresy it may seem, but perhaps defaulting to the time-honored turkey isn’t the best choice when planning Thanksgiving dinner. After all, many greenies spend the other 364 days of the year caring deeply about how sustainable, humane, and local their meals are. Why should a Thursday in November be any different? Why shouldn’t we examine our menu choices more closely before going with the venerated poultry? To tell the truth, I love traditional holidays almost as much as I love a good turkey breast. But this year, I decided to do some digging to find out if any other main dishes could beat out the old gobble-gobble when it comes to eco-friendliness. So, what should be on my menu for the greenest Thanksgiving possible? Here are the results, in ascending order. Surprise! The regular old grocery-store turkey was the hands-down worst option. The vast majority of holiday birds are Broad Breasted Whites, genetic mutants that can’t reproduce on their own, and are often factory-farmed. In fact, on the Disturbing Scale©, the lives of typical birds are right up there with The Silence of the Lambs and this Michael Jackson baby doll. Automatic DQ. You might think that in the soggy, ‘shroom-infested Northwest, a bounty of fungi would make for the perfect main dish. But putting aside the fact that sending my mycologically uneducated self traipsing into the woods with a picnic basket is an invitation for projectile vomiting at best (and, ya know, death at worst), this isn’t a great time for mushrooming. The choicest bits are all a significant drive away this time of year, not that I would be able to identify them anyway; and a dry fall made for a crappy ‘shroom season. So wild mushrooms are tougher to find, but let’s also consider their nutritional value: kinda minimal. I know they’re considered a vegetable and all, but mushrooms provide just traces of protein and fiber, plus a handful of vitamins and minerals. Not bad for a side dish, but America, we can do better. Oh please. 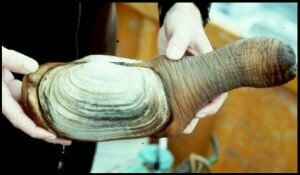 Don’t let it be the geoduck. If you’ve ever seen this two-pound abomination of a mollusk, you’ll understand my aversion to setting one out on the holiday spread. But it must be considered: The burrowing geoduck is “extremely abundant” in Puget Sound, and harvesting it has a negligible environmental impact — in fact, wild-caught gooeys earn a “Best Choice” rating from the Monterey Bay Aquarium. And, uh-oh: They’re a great, low-fat source of iron, protein, and vitamins, plus, hey, they’re tasty. But wait: Here, geoducks are only catchable during the extremely low tides of spring and summer. Whew. I really didn’t want to explain to my friends why our holiday feast comes in Dirk Diggler-sized portions. Plus, snagging a geoduck is really, really hard. Here’s a promising candidate! Hearty, healthy, delicious, and practically the patron saint of the Pac NW — give me a reason not to serve salmon for Thanksgiving! Well, turns out that Washington coast salmon face habitats threatened by pollution, development, and dams, and local populations have declined quite a bit. Oh, and they might be high in PCBs. The fleshy fish is doing much better in Alaska … but that’s not exactly local, is it? S’ok, I like crab, too, and the mighty Dungeness delivers in the culinary-drama department. This local species also bears a “Best Choice” stamp: Fishing management out here is considered top-notch, with strict rules about harvesting only males that are big enough to have bred already. Because they’re caught in small, individual traps, the risk of unintentionally massacring loads of other sea creatures is very low (bycatch, for you salty dogs). Dungeness crabs grow quickly and reproduce like the dickens, making the population very resilient to fishing pressure. Also consider: Crab meat is pretty healthy (high in protein and low in saturated fat; and while it does score higher on cholesterol, it still ranks under eggs). Crab meat is also expensive. At one large Dungie per person, we’d be looking at roughly $180 to feed six. It cheers my heart to learn that it’s possible to eat turkey with a clear conscience after all. But it’s gotta be a true heritage bird from a local operation, where the breeds are hearty, turkeys can actually walk, and life is lived under the open sky. Luckily, several such farms exist in my area (though you’ve got to order well ahead of time). Except for the oysters. Briny, gray, and the consistency of a cold booger, calling these bivalves an acquired taste is like saying Michael Jordan was OK at layups. But hear me out: First of all, Puget Sound is lousy with famed oyster farms — operations so well-run they also earn the coveted “Best Choice” designation [PDF]. But here’s the kicker: Not only does oyster farming do minimal harm to the ocean, it actually helps water quality. That’s right, these little filter feeders skim nutrients, plankton, and bacteria out of the waves, resulting in better coastal water conditions. A basically healthy (high in protein, iron, and a bunch of vitamins and minerals, if a bit cholesterol-laden), coveted delicacy with a net positive eco-impact? Ladies and gents, we have a winner. Disgusted? I hear you — I used to think oysters were vile little stomach bombs on the half shell, too. But when I moved to Seattle, I tried another one, and another, and suddenly, the wide world of delicate flavors and ocean terroir revealed itself to me. They’re intense — I can usually only handle about three at any one sitting — but to my surprise, I now actually love them. I hope my guests do, too. Happy Thanksgiving, everyone, and happy slurping!